Recognizing the historic influence that the neighborhoods, people, and businesses of the University District have had on the development of Columbus, the University District Organization Archives Committee was created to initiate and facilitate history preservation projects. Anyone who has lived or worked in the neighborhood around Ohio State, may be interested in a new book just published by the History Press. 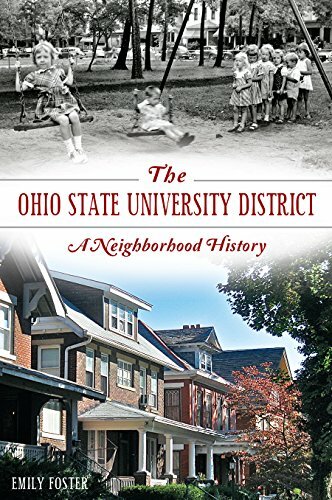 The Ohio State University District: A Neighborhood History collects 100 years of first-hand accounts of life in this historic, diverse, lively and sometimes crazy district. Stories range from picnics in the bucolic University Woods to riots and teargas along High Street. Buckets of beer? Zoning wars? Charbert’s, Larry’s, Hennick’s and Long’s? The Earth Shoe store? They all come to life on the pages of this book, along with a century of photos. $19.99 at bookstores and Amazon. All proceeds go to the University District Organization. To contribute materials, to arrange a recording of your oral history, or to get more information about our project, take a look at our brochure or email Emily Foster at info@universitydistrict.org or phone 614-294-8404.